WINDHOEK (Reuters) – Construction of a railway line connecting Botswana’s Mmamabula coal field with the Namibian port of Walvis Bay, pegged at up to $9 billion, is expected to start in 18 months, a government official said on recently. Robert Kalomo, Namibia’s Director of Railway Affairs in the Ministry of Works said construction of the TransKalahari Railway would take five years, with costs expected to range between $5-9 billion. Most southern African countries are heavily investing in rail line expansions to transport more export coal to ports to meet growing global demand, especially from Asia. Exporters in South Africa, a major exporter of coal to power stations in Europe and Asia, have failed to ship all their export coal due to bottlenecks on the rail lines leading to the Richards Bay Coal Terminal. The Trans-Kalahari line would stretch over 1,500 km from Mmamabula to Walvis Bay, with a possibility of a connection to the South African Waterberg coal field, touted to become South Africa’s next major coal mining area. Twenty-one consortiums have submitted bids for the project, including Canadian-listed CIC Energy Corporation that plans to exploit Mmamabula, Kalomo said. CIC said last year it was bidding to build the line together with diversified miner Exxaro, AIIM, Maropule, the Industrial Development Corporation (IDC) and the Development Bank of Namibia. Botswana and Namibia aim to appoint a successful bidder by mid-2011, and a pre-feasibility study, funded by the World Bank, is expected to be completed by March. Namibia is also expected to construct a coal terminal at Walvis Bay. “The setup of this terminal is not specified, but it will be as modern as possible to reduce harmful side-effects on the environment,” Kalomo said. He added that the country was also looking at extending its rail network to Katima Mulio on the Zambian border at a cost of N$7 billion. 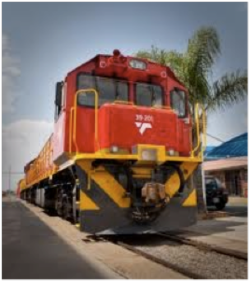 The Namibian-Zambian rail line would enable Zambian minerals to be exported via the west-coast port, avoiding the congested routes through Durban and Dar es Salaam in Tanzania. “Namibia (would) also revisit the idea to construct a new port at Cape Fria near the Angolan border,” Kalomo said, adding that this project was in a pre-feasibility phase.